Item description: Newspaper article, “Latest News. 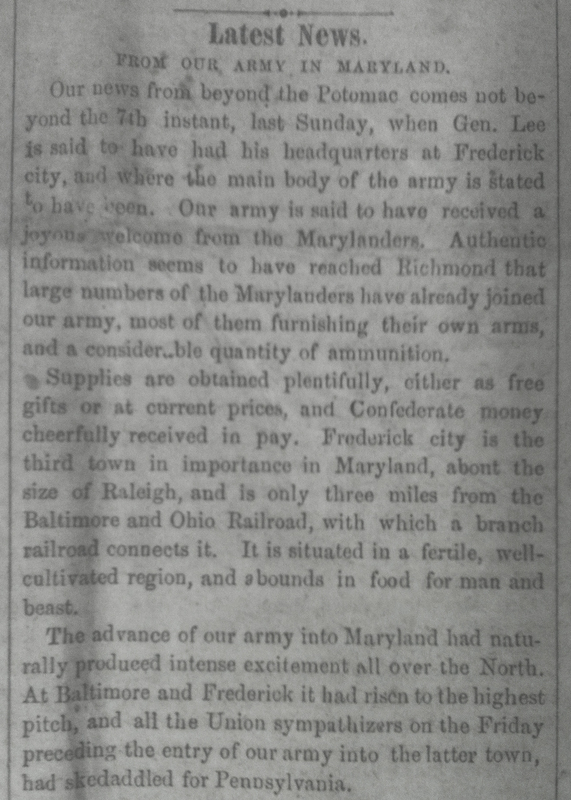 From our army in Maryland,” from the 17 September 1862 issue of the Weekly State Journal (Raleigh, N.C.). The article reports on the latest news from the Maryland Campaign, leading up to the 17 September 1862 Battle of Antietam. Item citation: “Latest News. From our army in Maryland,” Weekly State Journal, 17 September 1862. Raleigh, N.C.: John Spelman. C071 S79j. North Carolina Collection, Wilson Library, University of North Carolina at Chapel Hill. FROM OUR ARMY IN MARYLAND. Our news from beyond the Potomac comes not beyond the Potomac comes not beyond the 7th instant, last Sunday, when Gen. Lee is said to have had his headquarters at Frederick city, and where the main body of the army is stated to have been. Our army is said to have received a joyous welcome from the Marylanders. Authentic information seems to have reached Richmond that large numbers of the Marylanders have already joined our army, most of them furnishing their own arms, and a considerable quantity of ammunition. Supplies are obtained plentifully, either as free gifts or at current prices and Confederate money cheerfully received in pay. Frederick city is the third town in importance in Maryland, about the size of Raleigh, and is only three miles from the Baltimore and Ohio Railroad, with which a branch railroad connects it. It is situated in a fertile, well-cultivated region, and abounds in food for man and beast. The advance of our army into Maryland had naturally produced intense excitement all over the North. At Baltimore and Frederick it had risen to the highest pitch, and all the Union sympathizers on the Friday preceding the entry of our army into the latter town, had skedaddled for Pennsylvania. This entry was posted in North Carolina Collection and tagged Battle of Antietam, Battle of Sharpsburg, Maryland, Maryland Campaign, Weekly State Journal. Bookmark the permalink.